I spent a few hours today at Saint Joseph’s Abbey in Spencer, MA, and then later in the day had lunch with a friend, Msgr. Robert Johnson in Worcester. It was beautifully sunny but incredibly cold. 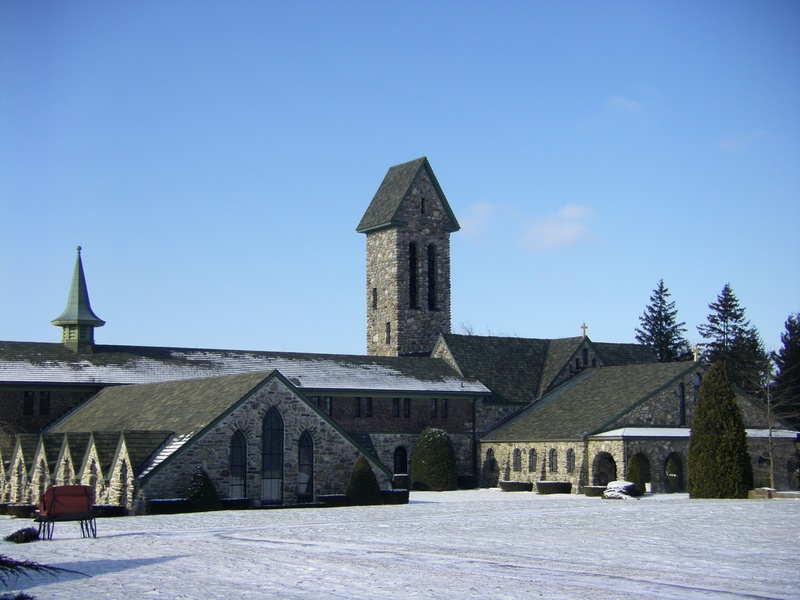 Spencer’s abbey has always held a special place in my heart because of the beauty of the location –on top of a hill with rolling fields and lakes– and because of friendship I share with some of the monks and the sacred Liturgy. 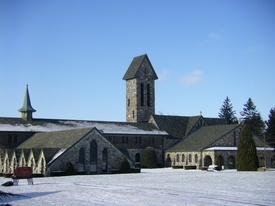 Saint Joseph’s Abbey is a monastic house of monks of the Order of Cistercians of the Strict Observance (OCSO), the Trappists. I even stopped by the Holy Rood Guild and purchased an icon of Our Lady of Perpetual Help and a linen amice. See the monks’ blog that’s periodically update, here. The monks of Cistercian Abbey, Spring Bank, WI, are featured in a PBS video. These monks are proprietors of LaserMonks.com, a non-profit work providing a discount prices items for your printers and other products (some of which made by monks & nuns of other monasteries). Watch the video…it’s fascinating to see their vocation lived. Long before dawn in the remote desert south of Barstow, the only light for miles around is a faint glow from a triple-wide trailer. Inside, several monks chant in Vietnamese. Then there is silence. The trailer is home to the first cloistered Catholic monastery in the Inland area. The white-robed monks pray and chant together seven times a day and silently meditate twice. Here in Lucerne Valley, off a dirt road and at the foot of barren mountains, there is little to disturb them. San Bernardino Diocese Bishop Gerald Barnes celebrated the opening of St. Joseph Monastery on Aug. 17, but for now, the two cream-colored trailers, a water pump and solar panels are all that sit on the 80-acre site. The monks hope to one day erect permanent buildings to house a chapel, retreat center and living quarters. Peter Pham, a Cistercian monk, delivers food at sunrise outside the St. Joseph Monastery in the Lucerne Valley south of Barstow. Six Vietnamese members of the Cistercians devote their lives to contemplation there. It will also serve as a Catholic retreat. St. Joseph is the second U.S. outpost of a Vietnamese congregation of Cistercian-order monks, who seclude themselves in monasteries to devote their lives to contemplation. The other opened in June near Sacramento. 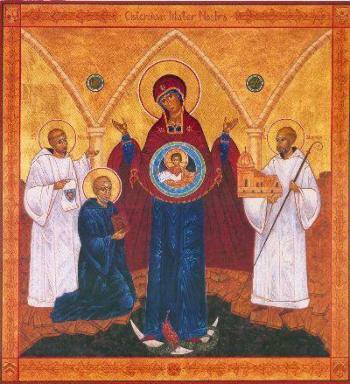 There are nearly 7,000 Cistercian monks and nuns worldwide. Most sites are open to the Catholic faithful for retreats, as St. Joseph’s visitors trailer will be in a few months. The monks and nuns in Cistercian monasteries typically spend little time outside them, except for shopping for groceries and other necessities, and for special events such as ordinations. Although the number of monks and nuns in U.S. monasteries has declined over the past few decades, experts say the drop has not been as steep as the fall in non-monastic priests and nuns. Proportionately more people choose a monastic life than before as a reaction to secularism and an increasingly fast-paced U.S. lifestyle, said Sister Patricia Wittberg, a professor of sociology at Indiana University-Purdue University Indianapolis. There are about 200 Catholic monasteries in the United States, but there is no reliable count of how many people live inside them. Like the parish priests who minister to their congregants and the nuns who serve the poor and sick, Cistercians and their devotion to intensely contemplative lives form a vital part of the Catholic church, said the Rev. Thomas Rausch, a professor of Catholic theology at Loyola Marymount University in Los Angeles. The monks of St. Joseph rise each morning at precisely 3:55 a.m.
Twenty minutes later, they gather in the dim light of the trailer’s chapel to chant for a half-hour. Then comes 30 minutes of meditation broken by the ringing of a bell announcing daily Mass. The rest of the day is dedicated to prayer, meditation, singing, Bible-reading, study and work. They speak to each other as little as possible, said the Rev. Anthony Pham, the monastery’s superior. “Most of our time is for God,” Pham said, as he ate a breakfast of fried eggs topped with soy sauce. Pham said that, while he is meditating, he reflects upon God’s love and the meaning of his calling as a monk. Work is an integral part of monastic life. As much of it as possible is manual labor, to leave the monks’ minds free for contemplation. The monks are now clearing brush, digging trenches for pipes, grading land and performing other tasks to build and adorn their monastery. Like other monasteries, St. Joseph must be self-supporting, so the monks are discussing possible business ventures. Other monasteries make products such as beer, fruitcake or cheese, and one in Wisconsin sells toner cartridges under the name Lasermonks. The St. Joseph monks are thinking of opening an on-site gift shop featuring Vietnamese religious articles that they would also sell online. Or perhaps they’ll make tofu for Vietnamese markets. The 12-bed retreat center that will open in several months is why the monastery exists. A Vietnamese priest from Santa Ana, who attended a Cistercian boarding school as a boy, contacted the Cistercian order to convey the need for a retreat house geared toward Vietnamese immigrants, Pham said. Many older Vietnamese Catholics do not speak English and would not feel at home or get the spiritual nourishment they seek if they were to attend a retreat at an English-speaking monastery, he said. They and many other Catholics yearn for a place to recharge, to take a break from their busy lives to focus on their relationship with God, Pham said. The retreat guests — visitors who are not Vietnamese will be welcome as well — will participate in the same prayers, singing, meditation and other devotions as the monks, Pham said. If asked, the monks will guide them, suggesting which Biblical verses to read. 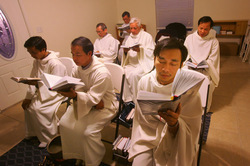 But much of the benefit of a retreat will be the example the monks set, Pham said. Even more than parish priests, the monks forgo worldly goods. Because they rarely leave the monastery, they have few material needs. They do not eat meat, as a way of sacrificing for God. When a permanent monastery is complete, Pham will spend almost all his time there. Until then, Pham is busier than he would sometimes like. He regularly interrupts the contemplative life of Lucerne Valley to drive to Victorville. There, he fills out forms, applies for permits and talks with county bureaucrats. Even monks can’t avoid San Bernardino County land-use and building codes. He has a studded ring on his right hand that he rubs while driving, so he can pray the Rosary while on the road. All six monks who live at the monastery spent at least six months at a Benedictine monastery in Pennsylvania to improve their English and acculturate themselves, Pham said. Two more monks are now in Pennsylvania, preparing to move to St. Joseph. The goal is to have 13 monks by the end of 2009. The monks receive several-thousand dollars a month to support themselves and the monastery. Most money comes from Vietnamese immigrants in Orange County. Further donations, along with revenue from the monks’ forthcoming business, will fund the construction of the permanent monastery. The trailer chapel where the monks now spend much of their time is spare. 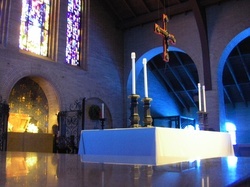 The monks sit on white plastic chairs or kneel on a blue-and-white carpet before a crucifix and a wooden altar carved in Orange County by a Vietnamese craftsman. Statues of St. Joseph and Our Lady of La Vang — an apparition of the Virgin Mary in 18th century Vietnam — stand near a plaque commemorating Bishop Barnes’ visit. Outside, there is little but sand and desert brush. 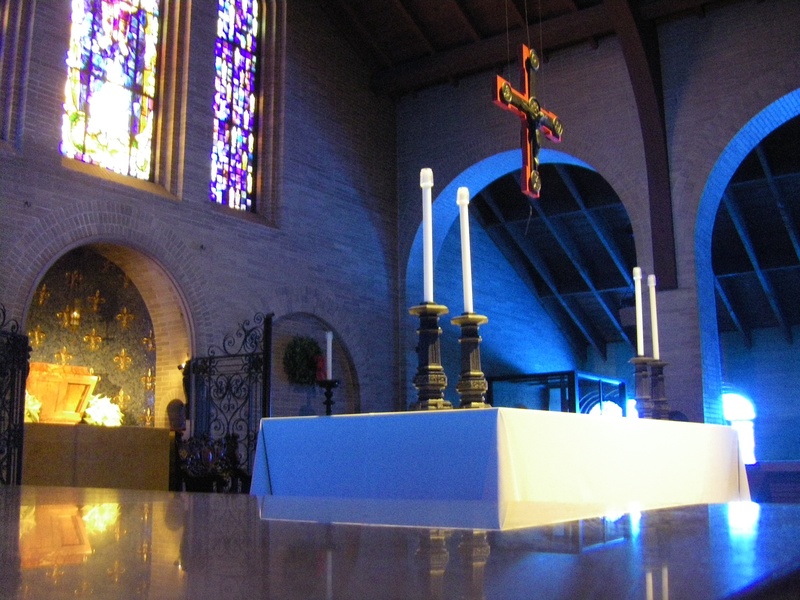 Lucerne Valley was chosen for the monastery because it is remote enough to foster contemplation but within driving distance of the huge Vietnamese community in Orange County. The land cost $80,000. Pham started paying for it with his $200 monthly stipend, along with donations from Vietnamese families.It was a risk. Pham knew the money wasn’t enough to pay the entire cost of the land. But he trusted in God. Then a Vietnamese family took him to Florida with them on vacation. By chance, he met a wealthy Vietnamese Catholic there. Pham mentioned the monastery he was building. He didn’t ask the man for money. But by the time he left Florida, the man offered to pay the remaining cost of the land. “I didn’t know this person, and I didn’t have the money to pay for the land,” Pham said. Their creed is “Ora et Labora,” or “Prayer and work.” Most of a Cistercian monk’s day is spent in contemplation. The monks at St. Joseph are called Common Observance Cistercians. 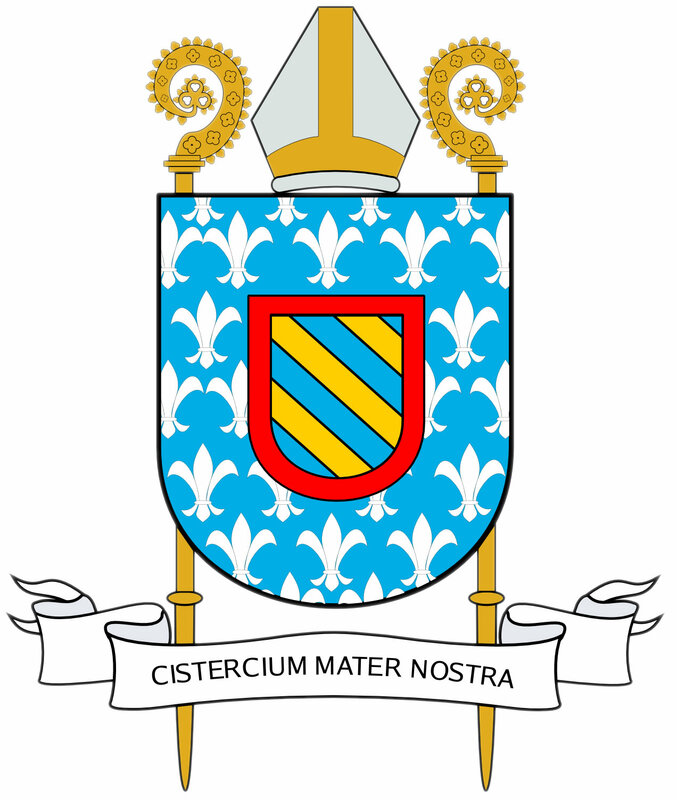 Perhaps better known is the Cistercian Order of the Strict Observance, commonly known as Trappists. The Trappists initially had a stricter interpretation of monastic rules, but today differences between the Common and Strict Observance Cistercians are negligible and there are discussions to unite the two orders. 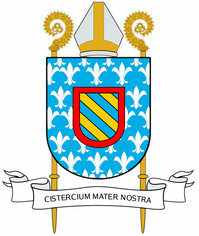 There are nearly 7,000 Cistercian monks and nuns worldwide. The mother abbey for St. Joseph Monastery, Phuoc Son Abbey, is outside Ho Chi Minh City, Vietnam. Cross by Emperor Saint Constantine’s mother Saint Helena in Jerusalem (AD 325). 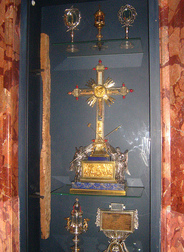 The Tradition says that Saint Helena found the Cross and the relics of the holy Passion and then brought them to Rome where they are venerated at the Basilica of the Holy Cross in Jerusalem. 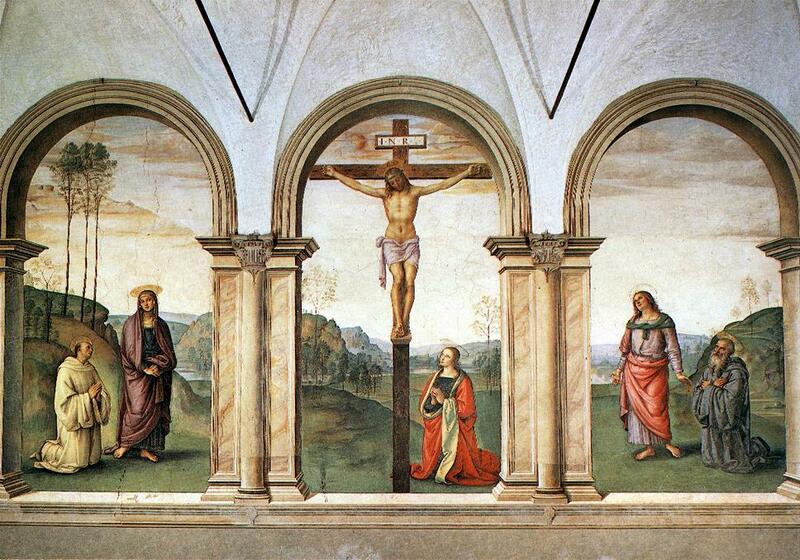 On the spot of the discovery, she built the Basilica of the Holy Sepulcher keeping a portion of the Cross at there. The sacred Liturgy gives us the image of the Holy Cross because it brings together the historical reality of the Cross with its theological import: mystery of the life and death of Christ. This is not a feast celebrating a “terrific find” at an archaeological dig; it is a feast of our faith as the Cross is a central symbol of our faith. 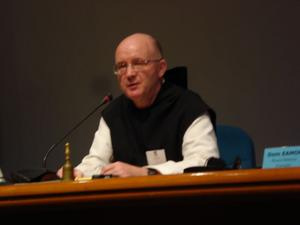 Dom Eamon Fitzgerald, Abbot of Mount Melleray (County Waterford, Ireland) has been canonically and regularly elected as abbot general of the Order of Cistercians of the Strict Observance. In 2007, Dom Eamon was re-elected for his 4th 6-year term abbot of his abbey; the new abbot general was born in 1945. Dom Eamon succeeds Dom Bernardo who has served for the last 18 years as abbot general. According to the statistics of January 1, 2008, there are 2,185 monks and 1,782 nuns, for a total of 3,967 persons living in 47 different countries. In context the Trappists are canonically speaking, a monastic Congregation which at present unites 97 monasteries of monks and 72 of nuns. May God grant many fruitful years to Abbot Eamon! Paul A. Zalonski is from New Haven, CT. He is a member of the Fraternity of Communion and Liberation, a Catholic ecclesial movement, and an Oblate of Saint Benedict. Contact Paul at paulzalonski[at]yahoo.com.